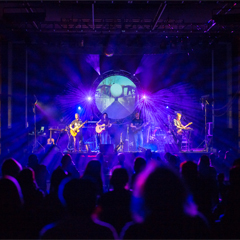 Darkside, The Pink Floyd Show is a tribute to the music of Britain's greatest progressive rock band. After clocking up over 120 performances, at theatres stretching from Brighton to Glasgow, Darkside return to the Wulfrun Hall, in their home town, with the Any Colour You Like tour. Seven musicians will deliver with empathy and passion a brand new show with tracks from the massive back-catalogue of Pink Floyd from the early magical days of Pink Floyd founder Syd Barrett through to later iconic albums renowned for their complex structures such as Dark Side of The Moon, Wish You Here, Animals and The Wall. The emphasis will be on replicating the experience of Pink Floyd live on stage which many believe was Floyd at their very best. As would be expected the show incorporates a spectacular and dramatic state of the art laser light show and evocative projected images and animated sequences on a circular screen made popular by Pink Floyd live performances.